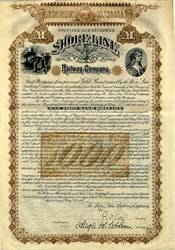 Beautiful $1,000 Gold Bond Certificate from the Shore Line Railway Company of Province of New Brunswick, Canada issued in 1890. This historic document was printed by New York Bank Note and has an ornate border around it with a vignette of a railway worker and a woman. This item has the signatures of the Company's President and Secretary and is over 123 years old. Coupons attached on top. In the matter of the Shore Line Railway. Complaint was made to the Board that the Shore Line Railway, running between the city of St. John and the town of St. Stephen, in New Brunswick, was unsafe for trafiic. The board caused its inspecting engineer to make an examination of the said line of railway, and upon his report, made an order forbidding the running of trains, cars or engines over the railway between certain points named. Against this decision and order a protest was made on behalf of the New Brunswick Southern Railway Company, the company now operating what was and is still known as the � Shore Line Railway,� upon the ground that the Board had no jurisdiction or authority t0 direct or enforce the stoppage of trains or the operations of said railway. The undertaking of the Shore Line Railway Company was, by Act of the Parliament of Canada, chapter 63 of 58-59 Victoria, declared to be a work for the general advantage of Canada, and that Act provided that the Railway Act of Canada should apply to the company and its undertaking instead of the laws of the province of New Brunswick and the Railway Act of that province. Later, the'Shore Line Company defaulted in the payment of its bonds. Proceedings were taken in the courts of New Brunswick, as a result of which the railway was subsequently sold, and the sale was followed by an Act of the New Brunswick Legislature, chapter 74, 1 Edward VII., incorporating the New Brunswick Southern Railway Company for the purpose of acquiring, holding and operating all or any part of the Shore Line Railway; and also all the capital stock, bonds. rights, franchises, powers and privileges, and properties of the said Shore Line Railway; and by chapter 102 of 3 Edward VII., an Act of the said legislature was passed confirming the deed of conveyance of the property and franchises of the Shore Line Company to the New Brunswick Southern Railway Company. Blair, Chief Commissioner (3 Can. Ry. Cas., p. 277).